Select the lowest role which should be able to access the following capabilities within NextGEN. 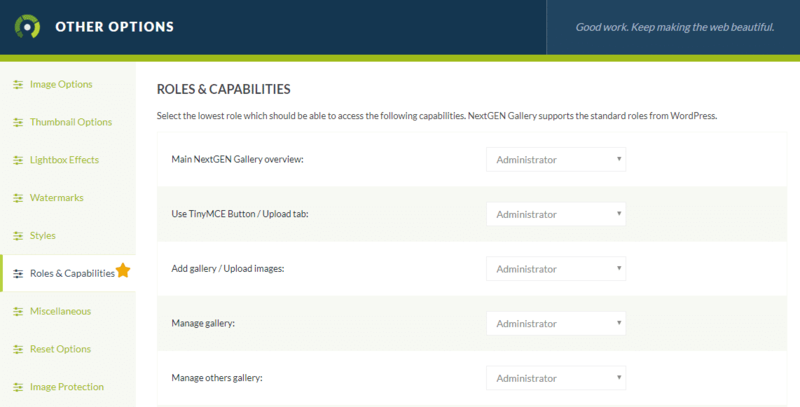 NextGEN Gallery supports the standard roles from WordPress; subscriber, contributor, author, editor, and administrator. If you set 'Add Gallery/Upload Images' to be 'editor', only an editor and administrator will be able to add images to a gallery and create a gallery. If you set it to 'subscriber', a subscriber, contributor, author, editor, and administrator will be able to add images and create a gallery. You as a super-admin will always have full control of the NextGEN Gallery settings and options. These role settings do not apply to you. 'Roles and Capabilities' is accessed under Gallery > Other Options > Roles/Capabilities. If you do not plan to have anyone else manage your site, you can skip this setting.